Cornell research orchard seeks the perfect apple [Associated Press 2013-09-27] – Profiles Cornell’s apple breeding program under the leadership of Susan Brown. 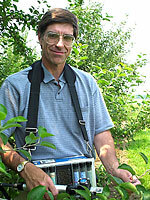 “The orchards, part of the New York State Agricultural Experiment Station, are essentially a 50-acre lab devoted to developing apples that are tasty for consumers and hardy for farmers. 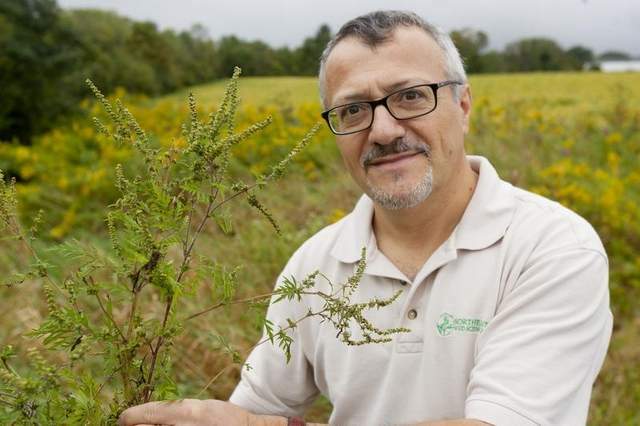 The station has released 66 apple varieties over more than a century including Cortland, Macoun and two new entries at farm markets this fall: SnapDragon and RubyFrost. See also video (below) and photo gallery. Ten Cornell specialty crops projects get USDA funding [Cornell Chronicle 2013-09-26] – Ten of the 11 research projects announced by N.Y. Gov. Andrew M. Cuomo Sept. 25, supported by more than $900,000 in federal funding provided by the U.S. Department of Agriculture (USDA), will go to Cornell projects. They range from improving the resiliency of New York’s crops to expanding the reach of New York state’s agricultural sector. This funding includes $154,000 to support the state’s wine and grape industry. From humble peanut to lifesaving legume [Cornell Chronicle 2013-09-23] – Cornell researchers, students and alumni are working alongside aid agencies in Haiti and Kenya to transform the humble peanut into a lifesaving legume. One is Bryan Sobel, M.S. 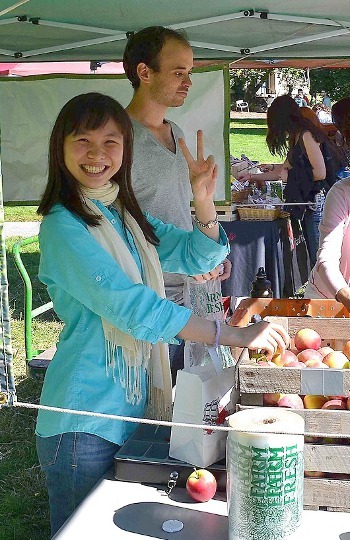 ’13, who is working as a research and extension programs specialist for Meds and Food for Kids. Sobel, who once worked in the nursery industry and studied agroforestry with associate professor of horticulture Ken Mudge as part of his graduate studies, hopes his hands-on background in agriculture will allow him to adapt well to Haiti’s dynamic agricultural systems. Cider is in at Cornell Orchards! Wine grapes and juice. View prices. Challenged by recent economic changes, is higher education turning into a private rather than public good? Obligations to the people were implicit in the designation of Cornell University as New York State’s land grant college on April 27, 1865. Almost three years before, President Abraham Lincoln signed the Morrill Land Grant Act during dark days of the Civil War. Cornell continues its land-grant mission today, meeting ever-changing needs of communities with the Extension Service. 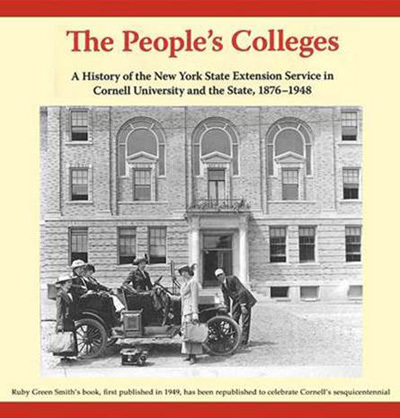 Ruby Green Smith’s book The People’s Colleges: A History of the New York State Extension Service in Cornell University and the State, 1876-1948, written more than 60 years ago, is essential reading for anyone working in higher education who shares a commitment to strengthening public engagement. Join Helene Dillard, Scott Peters, and Jane Mt.Pleasant in a Chats in the Stacks book talk about the important lessons Smith teaches us. The book, re-released by Fall Creek Books in January 2013 to celebrate Cornell’s sesquicentennial, has a new foreword by Dillard and a new preface by Peters that explains the cultural significance of the extension’s mission. 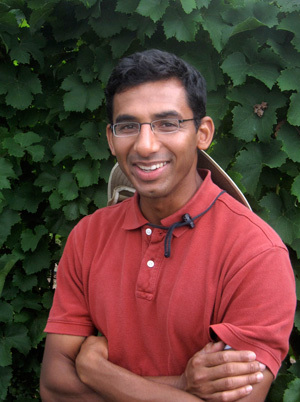 The techniques Pagay has developed as part of a collaboration with Abraham Stroock, associate professor in the Department of Chemical and Biomolecular Engineering, should make it possible to continuously measure the water status of grapevines, other crops, and soils to drive precision irrigation in vineyards, orchards, and other farms, improving their water use efficiency. Legislators learn about sustainable ag on campus [CALS Notes 2013-09-18] – On Sept. 4, New York State Assembly members Barbara Lifton (D-125), Samuel Roberts (D-128), Al Stirpe (D-127) and Addie Russell (D-116) were welcomed to CALS for a special sustainable agriculture research tour. After taking in Stocking Hall highlights and meeting with Agricultural Sciences majors, the group traveled to Freeville, where experiments in organic farming systems, tomato and squash breeding, and the Cornell Small Farms Program were showcased at the Homer C. Thompson Vegetable Research Farm. 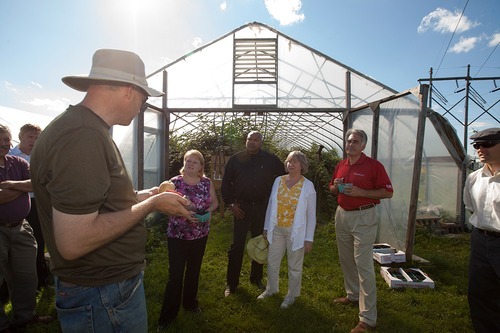 At the East Ithaca Farm, home to the Department of Horticulture’s hoophouse/high tunnel research, the legislators were introduced to the profitable potential of growing crops under the protection of high tunnels, including raspberry harvests in November, easier control of late blight on tomatoes, and a blossoming cut-flower industry. And just to make sure they’d think about CALS research all the way home, everyone left with blackberries and bouquets for the road! • Tip 1: Monitor ragweed pollen counts by visiting weather information websites, such aswww.weather.com, or www.nws.noaa.gov, and entering your zip code. • Tip 2: Limit contact with ragweed pollen by showering before bedtime, drying clothes indoors, avoiding putting fans in windows, washing your hands often, not wearing outdoor work clothes in the house, limiting your time outdoors when ragweed counts are high. • Tip 3: Seek treatment from an allergist. Allergists can prescribe medications to relieve symptoms and order injection therapy for persistent or severe cases. This conference is open to all audiences including the public, students, faculty and staff. Registration fee $75. Registration deadline extended to Wednesday Sept 25. Registration fee is $75. Space is limited. There is also a Friday evening only registration for the reception and Dr. Wapner keynote. We look forward to a great learning and networking experience with across disciplines. Dr. Alan Lakso presented a keynote presentation on innovations in fruit crop research to the Mexican Horticultural Congress held September 2-6 in Puebla, Mexico. A former student of Lakso’s, Dr. Guillermo Calderon PhD ’04, has been elected the President of the Mexican Society for Horticultural Science. As Vice President, he was the head of the organizing committee for the recent Mexican Horticultural Congress. Dr. Calderon is a professor at the Collegio de Postgraduados Montecillo in Texcoco, Mexico teaching fruit production and researching berries and peaches. The Cornell Lake Erie Research and Extension Lab boasts a new harvester–not for grapes or hops–but for solar energy. On Sept. 18, two arrays with a total of 136 photovoltaic modules were installed next to the hop yard. The system is expected to generate approximately 41,000kWh annually, roughly 30% of the electrical energy used by the lab. USA Today focuses on farming in a series of articles looking at how climate change is impacting the way Americans work, live and play, noting the northward migration of warm-season crops as the planet warms. The impact on New York? New York state used to be considered too cool to grow soybeans. In 2013, farmers planted a record 320,000 acres of the protein- and oil-rich beans. “The Upstate New York farmers didn’t think they could grow soybeans and now they can,” says David Wolfe, a professor of horticulture at Cornell University in Ithaca, N.Y. The state is the nation’s third-largest grape producer, and the Finger Lakes region is becoming prime wine-grape-growing country. The area’s historic climate was too cold for European wine grape varieties, because winters often got below the 12 degrees that kills vines. 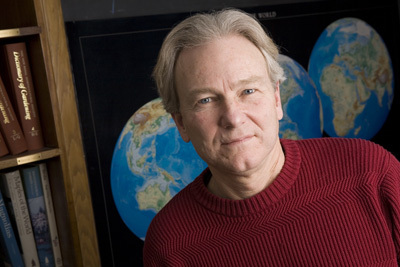 “But since the 1970s, we’ve had a reduction in the frequency of years since we’ve had that cold a winter,” Wolfe says. Warmer winters are a problem for some farmers. Many fruits require an extended period of cold. 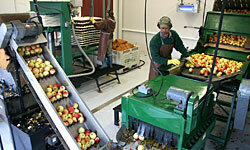 Studies show that apple yields in New York state are lower in years when winters are warmer than average. If you missed Larry Robertson’s seminar Monday, Vegetable Germplasm Conservation and Characterization at the Plant Genetic Resources Unit, it’s available online.